(CNN) - Priorities USA, a super PAC backing President Barack Obama's re-election bid, paired up with the Service Employees International Union (SEIU) to unveil their first Spanish-language TV ad Monday, a spot entirely devoted to attacking Mitt Romney. The ad features clips of some of Romney's notable gaffes on the campaign trail, largely those critics used to highlight his wealth and paint the presumptive GOP presidential nominee as out of touch. "You can focus on the very poor, that's not my focus," Romney says in the first part of spot, a comment he made in a CNN interview the day after he won Florida's primary earlier this year. Opponents quickly pounced on the remark at the time, but Romney's team argued the quote was repeatedly used out of context. "I said I'm not concerned about the very poor that have the safety net, but if it has holes in it, I will repair them," Romney said later in the interview, adding that his campaign is focused on "middle income Americans" that don't have a government "safety net." 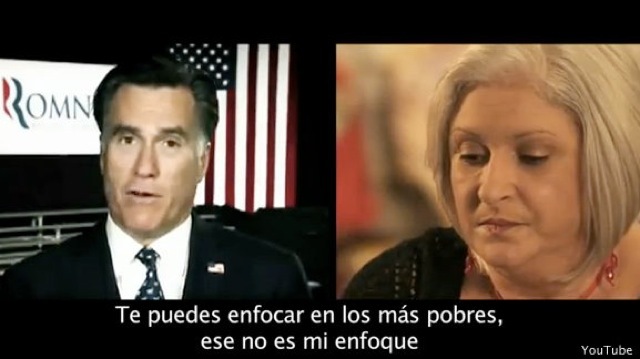 In the Priorities ad, a woman says in response to Romney's quote (in Spanish): "What about us? He's not thinking about us." Another man adds: "It's easy for him to say that since he doesn't have the same necessities as us." Using text on screen, the spot also takes a shot at Romney's private equity career, a tactic Democrats have adopted as a primary line of attack against the candidate. "Mitt Romney made millions of dollars leaving thousands of people without work," the screen reads. The commercial then resurfaces an old joke Romney, a multi-millionaire, made last June while speaking with unemployed people at a Florida campaign stop. "I'll also tell my story: I am also unemployed," he said to laughter in the small crowd, adding that he's got his eye on a certain job. After being asked about the comment later in the day, Romney said he was only poking fun at himself. "I'll always make light of myself, and self deprecating humor is part of who I am," Romney told reporters. In the commercial, a man responds to the clip, saying unemployment is no laughing matter. "When you are really out of work. you are worried, you don't want to laugh or make fun of anybody," he says. The Latina voter in the commercial adds: "I feel that he should not be the person that leads this country." The ad ends with text displayed on the screen: "Mitt Romney: His words say it all." Totaling $4 million, the ad will begin running Monday in the toss-up states of Colorado, Nevada and Florida. While this particular version will air in Florida, similar lines of attack are used in the TV spots to run in Colorado and Nevada. "This ad is part of a broader effort to ensure Latino voters know the stakes in this election and who has been on the side of Latino Families and who will continue to stand with them in the coming years," said SEIU National Political Director Brandon Davis. The same joint enterprise between Priorities and SEIU has previously targeted Romney using radio ads in Spanish, in which they painted the former Massachusetts governor as a candidate with "two faces" and someone who panders to the Latino community while favoring policies such as "self-deportation." Romney's campaign responded to those ads, calling them a "dishonest smear" against the candidate. "Hispanics, like all Floridians, are supporting Mitt Romney because they know he has a proven record as a conservative businessman, and is the best person to rebuild the economy that President Obama has spent three and half years destroying," Romney adviser Albert Martinez told CNN at the time. Latinos already help him, and no amount of sellout Rubio could change that. He does not responde to the DREAM ACT. We will not repond to ji,. Governor Romney does not like hispanics. He is courting them now so he gets their votes. GOP in general only talks about hispanics in election time. Democrats consistenly have being concerned with the need of hispanics and other inmigrants. President Obam will have their suport and votes. Perhaps the Miami cubans will vote for Romney, they are a different breed and have always gotten a VIP treatment so different than the other latinoamerican inmigrants. Viva Obama ! We also need the anti-Rmoney ad here in Arizona. Mr. Corporation thinks Americans are stupid. It is time for Hispanics to stand up and call Romney and the Republicans out for their bigotry towards anyone who is not white, male, and rich. Republicans think all Hispanics are illegal, ignorant, poor, and only capable of cleaning houses and using leaf blowers. Republicans constantly demean Hispanics, fight against all legislation to help the Hispanic community, and Romney even talks about Hispanics "self-deporting". Republicans could care less about the Hispanic community and need to be reminded Republicans will betray them as usual. Hispanics are not with Mr Romney. We stand behind President Obama! My fam is very conservative & have always voted Republican, up until 2008 election. Voting for then senator Barack Obama was a first & Initially they were a little apprehensive about voting for somebody unknown at that time, but when Mccain choosed Palin as his VP, they were convinced that voting for Mr Obama was the sane choice. Now 3 years later, they are happy the choice they've made. Election time for them means a way to express what they think of our elected sa oficiaban. Seeing how much money it is thrown on this election & all the nastiness coming from the Republicans is very disappointing. We hope & pray that Mr Romney doesn't win because to us that is a setback.. there is something about Romney that just doesn't seem right. He seems dishonest & not trustworthy. We want to move forward & that path can only b taken with President Barack Hussein Obama! i' m ecstatic knowing my fam finally came to their senses& h opened their eyes on what the Republicans stand for & that certainty is not with the hispánic community.. Yez!. The self deportation crowd(like most of America) won't vote for Mitt McCain. Bien dicho (well said). Ustedes no son importante para el flip flopper (you are not important for the flip flopper). Just look at his life. Nothing about being poor or middle class or struggling. The worst thing that has probably happened to him is that instead of making millions firing Americans he only made thousand of dollars (and I bet that didn't happen). Not when you buy a company worth $205M for $18M, bankrupt the company (KB Toys) and still walk away with bain capital money of $85M! Willard, you're a professional campaigner, so you can never be unemployed. Everything is not a laughing matter. People really do need work and your record as governor shows that you're not up to the job of creating JOBS. You don't have to paint him as out of touch. Every time he opens his mouth, he proves he's completely out of touch with America and reality. Todos unidos podemos! United we can! Hispanics 4 Obama! It goes without saying that Hispanics will NOT come out to vote for Romney. We're strongly entrenched behind the man that is moving our country forward, President Barack Hussein Obama. It is also our fervent hope that Romney continues to waste millions upon millions of dollars advertising for our vote on spanish t.v. and radio, all to no avail. Any Latino that REALLY follows fair and balanced news as well as elective politics will automatically know that the political ads that are being aired by the Mr. Obama administration are mainly a bunch of more and more lies perpetrated on Latinos. (Most, if not all the Latinos featured on the ads have been handsomely compensated.) We Latinos need to ask ourselves "what has the Mr. Obama administration REALLY done for us"?! And, if you are a realistic, self thinking Latino, you will come to the following conclusion: "ABSOLUTAMENTE NADA." Be wise to all the lies and games perpetrated on Latinos and other groups by the so called Mr. Obama Election Team. These people have no shame and just like the president; will lie to your face. Latinos of America, PLEASE don't be fooled, AGAIN!!! I guess the ad makes it clear the Latinos' and union workers both need hand outs. One group wants government checks and the other gets inflated paychecks for doing as little as possible. In the end it costs all of us.